Our Sunday church services are set here for August 12. So right now we are extra busy cleaning everything. I know that we could have church services here without everything clean. To us though, that is our way of getting everything clean again. It gives us a goal to reach. We host church services once a year so at least once a year everything gets cleaned. It is always a good feeling and makes us feel like something got accomplished. Joseph, 16, Lovina, 14, and I went out in the garden this morning and pulled a lot of weeds. It was 65 degrees so it was nice and cool to get that job done. We also pulled most of the onions. We need to hang those up to dry so they can be used this winter. We are enjoying cucumbers, tomatoes, green beans, green peppers and hot peppers from our gardens. Our sweet corn is not ready yet but Mose and Susan brought us a meal of it. Joseph’s 16th birthday was on Tuesday, July 24. We had the sweet corn, cucumber salad, sliced tomatoes, green beans (with potatoes, onions, and carrots diced in) and hot wings for his birthday supper. Benjamin and Joseph grilled the wings on the charcoal grill. For dessert we had cake and watermelon. 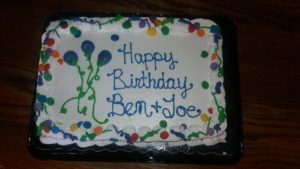 The cake was for both boys since we didn’t have a cake on Benjamin’s birthday. There are too many birthdays in July and sometimes too much cake. The boys wanted me to get one cake for both of them. Sometimes I just have a hard time with the fact that both boys are this old already. That also makes me appreciate that they are both healthy as far as we know and makes me remember others that are less fortunate healthwise. Our sympathy especially goes to Rebecca, David, and daughter as they mourn the death of their 17-year-old son Joshua. We only know them through the letters daughter Verena and Rebecca have exchanged. Joshua died due to complications from muscular dystrophy. His brother also passed away from Duchenne muscular dystrophy at a young age. Rebecca and David have only their 18-year-old daughter now and I can’t imagine the pain and sorrow this family is experiencing. May God give them strength to go on. Yesterday daughters Elizabeth and Susan came home for the day and of course our little sweeties Abigail and Jennifer came also. The young mothers brought breakfast for us which was French toast, pancakes, maple syrup, venison summer sausage, and brownies. That made my morning! Especially after a rude awakening: right before my husband Joe left for work, our neighbor Joe stopped to let us know our horses and ponies were out. They ran in the bean field so he closed the gate as he was on his way to work. My husband Joe’s ride was also here so I woke up the boys and they had to walk through the wet beans that are waist high to chase the horses into the other field. They came in all wet from the beans. Benjamin had time to change clothes as he had to leave for work at 4:30 a.m. The horses had broken the chain off the gate and that’s how they escaped. They stopped in my garden to eat some sweet corn, the way it looks. I’m just thankful they didn’t cause an accident on the road. With the girls all being home yesterday, we cleaned the basement, including the windows and bathroom down there. We also pressure washed the siding on the wrap-around porch and the floor and railings. I am so glad that is done. This week I will share a recipe I received from a reader—peanut butter sheet cake. Thanks Neva! Bring peanut butter, water, and butter or margarine to a rapid boil. Pour over flour, sugar, salt, and baking soda. Mix and add the eggs and buttermilk or sour cream. Pour batter into a greased sheet cake pan. Bake at 350 degrees for 20 minutes. Bring margarine, peanut butter, and buttermilk to a rapid boil. Add vanilla and powdered sugar. Frost cake while both are still warm.